One thing I am happy to get back into after the weekend is eating healthy food. I had so much delicious, but unhealthy food over the weekend that I am ready to find so more healthy options. I made quinoa for the first time last night and loved it and am excited to start using it more. Do you have any favorite, healthy recipes featuring quinoa? I’d love to hear about them. 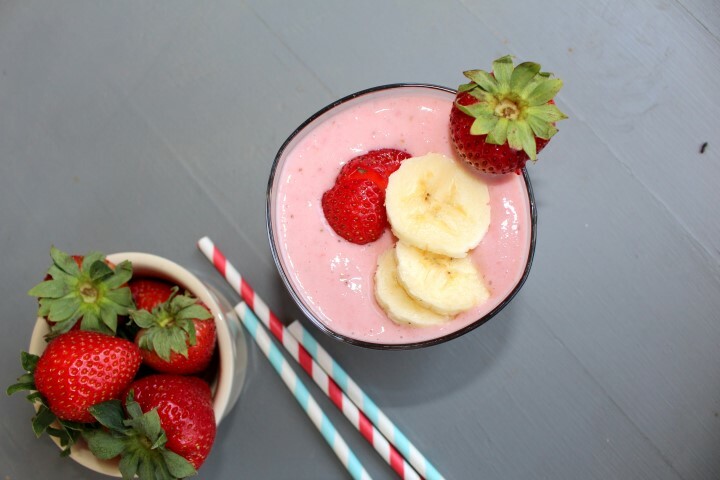 One of my favorite healthy staples is the strawberry banana milkshake. It makes a great breakfast when I’m in a hurry. Made with Greek yogurt, the extra protein help keep me full all morning. Yes, I suppose I could also be called a smoothie, but I like drinking milkshakes for breakfast. So a milkshake its gonna be! 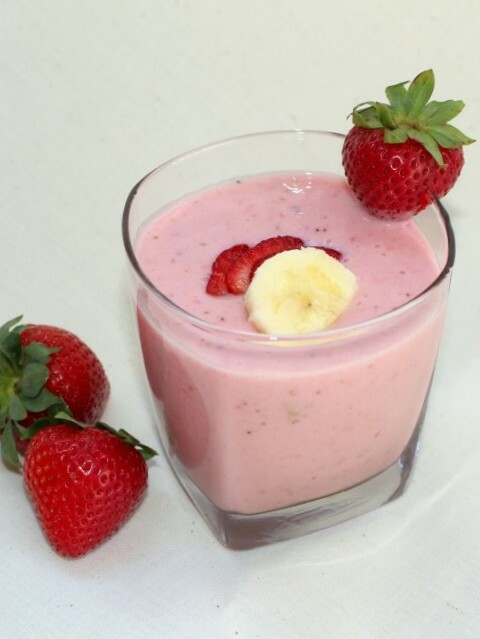 Place banana, strawberries, milk, Greek yogurt and honey in a blender and blend until smooth. Depending on your tastes and how sweet the strawberries are you may not need the honey. I usually skip the honey, but some people like it a bit sweeter. Pour into a glass and garnish with additional fruit if desired. I could (and should) eat this every day for breakfast, so good!! Yes, and so easy too! I wish I was enjoying one of these for breakfast! Me too! The hardest part for me is keeping ripe bananas in the house. I think I’m too picky about them. I freeze my fresh bananas cut into pieces and my strawberries as well. then put them into the blender frozen you dont need as much ice that waters down the smoothie.I dont have to worry about my bananas not being fresh tasting that way. Thanks for the tip, Beth! Oh, flax would be a great addition! LOVE strawberry banana smoothies/milkshakes! We add some flaxseed to ours!